IDAS are delighted that Margaret Sentamu has offered to support the organisation as a patron. Following a recent visit to one of our refuges in York, Margaret told us that she is extremely pleased to be able to help IDAS raise awareness about the extent and impacts of domestic abuse and sexual violence. Margaret is based in York and is a well-known public figure who works tirelessly to help further a number of humanitarian causes. 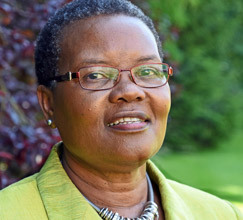 As a freelance Leadership Development consultant with a focus on diversity, Margaret has worked for a number of years in the private, public and third sector which included a period as Senior Selection Secretary, overseeing the team responsible for the recruitment of trainee clergy for the Church of England. Margaret is also a non-executive director of the Leeds & York Mental Health Trust and Traidcraft Plc, helping to fight poverty through fair trade. She is a Lay Adjudicator for the Solicitors Regulatory Authority and a Lay Assessor for CIPFA member accountants who breach the Code of Conduct and bye-laws. Margaret is sought out as a public speaker, preacher and she leads retreats, quiet days and pilgrimages. We are all looking forward to working with her in 2018.